Jordee Matson was looking for a move in the summer of 2017, and before long she landed a coaching job at Taylor Tennis Club. Matson, who grew up just outside of Thunder Bay in Neebing, Ontario, emailed Mario Trstenjak at Taylor to see if any work was available and sent in her resume. Matson once played an International Tennis Federation (ITF) junior tournament at Winnipeg Lawn Tennis Club. Matson hit her first tennis balls at age four. Her mom had taken up tennis and got her started in the sport. “I didn’t take it competitively until I was 11 or 12, and that’s when I stared becoming more serious,” said Matson. Tennis wasn’t the only sport Matson excelled at. In Grade 10 she won the city championship for badminton in Thunder Bay. Matson travelled a lot as a junior tennis player. 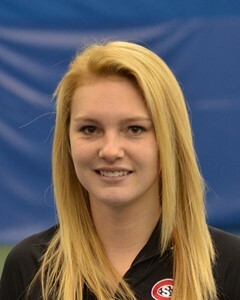 Matson was about 14 years old when she started working as a coach at Thunder Bay Community Tennis Centre. She spent about six summers coaching at the facility and was the junior development coordinator in her last two years. Matson played four years on the women’s tennis team at St. Cloud State University in Minnesota. She was the team’s captain in her senior year and graduated in 2016. Photo courtesy of St. Cloud State University.